Ridgefield’s second native-born Congressman apparently didn’t like politics much, preferring the world of high finance. 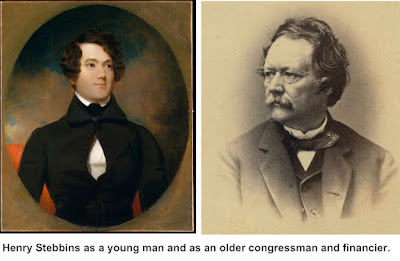 According to the official Library of Congress records, Henry G. Stebbins was born in Ridgefield in 1811, though the New York Times said in his obituary that he was a native of that city. in 1811. However, Mary Stebbins may have been staying with the family in Ridgefield when Henry was born. Clearly, the ruler blow had no lasting effect for, by 1833 and in his early 20s, the “errand boy,” was working for S. Jaudan & Co., and that year became a member of the New York Stock Exchange. In 1859, he founded his own brokerage, Henry G. Stebbins & Son. He became a colonel in the 12th Regiment of the New York militia in 1847 and for much of his life was known as Col. Stebbins. Stebbins eventually rose to the top of the stock exchange, serving three terms as its president: 1851-52, 1858-59 and 1863-64. During the last term, he was also a U.S. congressman. A Democrat, Stebbins was elected to the U.S. House of Representatives in 1862, took his seat March 4, 1863, but resigned on Oct. 24, 1864, six months before his term ended. He left because he felt his Democratic constituents didn’t support his hard-line approach to the Civil War; he was a strong supporter of President Lincoln’s handling of the conflict. Many Democrats just wanted the war to stop. “Throughout the session I favored a vigorous prosecution of the war, until the authority of the Government should be reestablished over every part of the United States,” he said in his letter of resignation to the “Democratic citizens” of his district.. “Throughout the session I was opposed to the taking of any steps to a peace calculated to weaken the national authority, or that required negotiations with men in rebellion who had not laid down their arms. “I am now convinced, though with much regret, and have now to acknowledge my conviction that in all these respects my conduct is, and would continue to be, disapproved by a large majority of those who elected me. A subsequent convention of the Union Party, a conservative party that promoted both the union and the constitution, nominated Stebbins to fill his own vacancy. “The bold and independent course of Mr. Stebbins, and the reasons which induced him to cut loose from the peace-at-any-price influences … should now receive a hearty indorsement from the War Democracy and all other Union men of that District,” The Times reported after the convention. “With proper effort, he may be returned to finish the term which he has so honorably begun.” He declined to do so. Stebbins continued as a leading financier in New York, including serving on boards of directors of major corporations. In late 1860s and 1870s he was president of the city Park Commission which oversaw Central Park, a trustee of the American Museum of Natural History, president of the Academy of Music, and commodore of the New York Yacht Club. He died in 1881 at the age of 70.